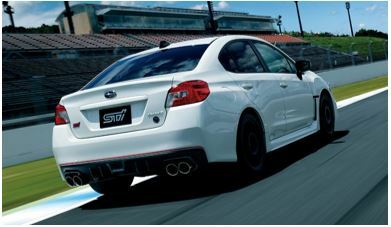 Tokyo, July 19, 2018 – Subaru Corporation and its motorsports subsidiary Subaru Tecnica International (STI)*1 today released the WRX STI TYPE RA-R, a special limited-edition model with just 500 units to be available in Japan market. The TYPE RA-R, based on the WRX STI, is the complete model to commemorate STI’s 30th anniversary of its establishment in 1988. Developed under the concepts of “light weight”, “speed” and “enjoyment”, the TYPE RA-R pursues “Running, Turning and Stopping”, the fundamental performances of an automobile. With the application of lightweight parts and even taking some parts off from the base model, the TYPE RA-R saves 30kg of weight compared to the previous complete models “S208” and “S207”, and is also 10kg lighter than the base model WRX STI. *2 *3 Combined with lighter body is EJ20 Balanced BOXER engine, which has also been applied for S208, delivering the highest output among all the STI complete models. With the power-to-weight ratio exceeding that of S208, the Type RA-R brings “speed” and ”enjoyment” at the highest level STI complete models have ever brought. The power unit enhancement the TYPE RA-R receives is not just EJ20 Balanced BOXER engine delivering 329PS. A performance shroud with high rigidity enables intercooler to work at its maximum cooling efficiency. A performance exhaust system with lowered backpressure also contributes to higher engine output and more direct acceleration response. With these enhancements, the TYPE RA-R engine revs up smoothly and its exhaust note evokes high performance of the car. Dampers and coil springs are exclusively designed for TYPE RA-R. The car is equipped with Michelin Pilot Sport 4S tires, which feature different compounds between the outer and inner parts of the tread and provide strong tire grip on both dry and wet road surfaces. Brembo brakes with high performance brake pads for stronger brake force are also adopted for this model. These enhancements give extra margins for the TYPE RA-R and better controllability provides peace of mind for driver. The TYPE RA-R must be ordered at Subaru retailers by December 17, 2018, and sales are limited to 500 units. *3: Replacement of spare tire with flat repair kit contributes to weight reduction, but the weight listed on brochure does not reflect it. ■DURACON® is a registered trademark of Polyplastics Co., Ltd. in Japan and other countries. ■Specifications are reference values. When registering the vehicle, the actual measured values apply, which may differ from those in the table above. *5: Height includes roof antenna. The roof height is 1,455mm. Since these vehicles have been customized, they must be physically presented at a vehicle registration office for registration.